24th of July, 2014, Thursday witnessed yet another Google update and this time they call it the Pigeon update. According to SEO sources, this update is especially affecting the local search algorithm. 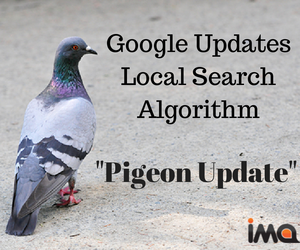 This Pigeon update has also intertwined local and organic indicators, results and algorithms and it also has got the potential to affect the rankings of many small business websites. As per what Matt McGee said, the Pigeon update will benefit big directory sites like TripAdvisor and Yelp, those that have a stronger SEO signal than the smaller ones. For all those businesses and websites, local search has got even more difficult than before. There are even reports that the new algorithm will provide a more useful, accurate and relevant local search results, which will be tied more closely to the traditional web search ranking signals. All these changes will also be visible within the search results of Google Maps and other Google Web search results. However, despite all these reports about the changes, the core changes are still behind the scenes. Due to the Pigeon update, there will be some local websites that will notice an increase or decrease in the web site referrals, business revenue and also leads, after this change. Google has reported that this new search algorithm will tie deeper into web search capabilities, which includes the hundreds of ranking signals that are used in web search, like spelling correction, synonyms, Knowledge Graph and even more. Apart from these, Google also said that this Pigeon update improves their distance and location ranking parameters. Let’s have a look at some of the noteworthy changes. This update has only been released to US English results, but the percentage of queries that have been affected hasn’t been reported. Major article directories like Zagat, Yelp, Urbanspoon, TripAdvisor and some others are seeing increased search engine rankings and increased influence in search results. Google also mentioned that this new algorithm enhances the distance and location ranking yardsticks and it aims to offer more useful and relevant experience for all the local searchers who are seeking local results. However, despite this, the individual business firms may find it tough to rank in search engine results. Google hasn’t yet thrown any comments on the exact percentage of queries that were impacted by this algorithm update, nor did it say anything about the spam algorithms that were deployed in this update. So, if you’re someone who has noticed any ranking changes for your local business, you should be sure that it is due to the changes in the search algorithm.